Conrad Tokyo is a luxurious modern icon with breathtaking bay views just minutes from the shopping and entertainment centers of Ginza and Roppongi. Awarded the highest level of comfort for hotels in the Michelin Guide Tokyo and the hotel with two Michelin-starred restaurants, Conrad Tokyo is the perfect choice for business and leisure travelers seeking a contemporary sanctuary in the heart of Tokyo. 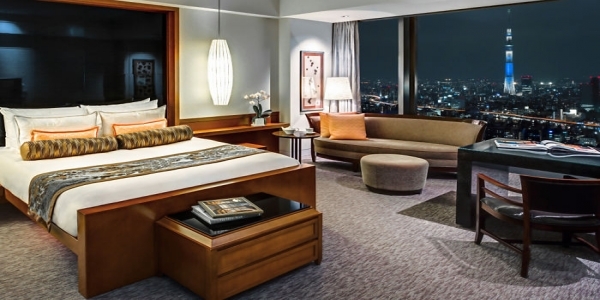 The 290 guestrooms and suites of this luxury Tokyo hotel combine contemporary luxury and technology with an atmosphere rich in the soothing and distinctive traditions of Japan. 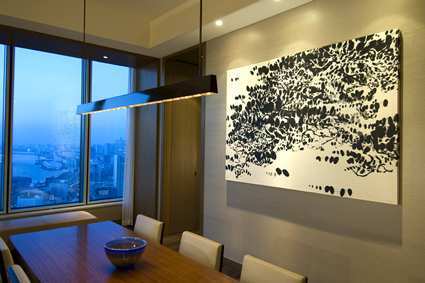 Conrad Tokyo’s design draws its inspiration from two key Japanese concepts: Sumie, the traditional black and white Japanese painting, and mon (gate). With Exhilarating panoramic views, exclusively created scented amenities, and one of Tokyo’s most spacious guestrooms, enjoy a truly luxurious experience when you choose the Conrad Tokyo hotel, Japan. Water and the moon, two of nature’s most powerful yet calming symbols, have been integrated into the design of what is the largest hotel Spa facility of its kind in Tokyo. 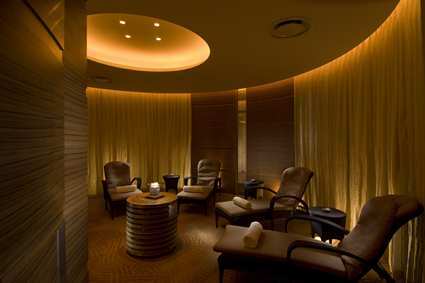 Sprawling over 1,400 square metres on the 29th floor, with ten private treatment rooms, Mizuki Spa is a harmonious cocoon where every imaginable indulgence awaits. Using the exclusive range of [comfort zone] products, a selection of spa rituals, treatments and cosmetics combine to create unforgettable experiences and extraordinary results. The Conrad Tokyo hotel’s spacious gymnasium is fully equipped with a full range of the latest Technogym exercise equipment for cardiovascular and weight training, and features an aerobics studio with scheduled exercise classes. The hotel’s fitness professionals are available to assist with training sessions. The facilities include ten spa treatment rooms, a 25-metre indoor swimming pool, a fully equipped gymnasium and an aerobics studio, as well as sauna and steam rooms with relaxation areas. Please note: the following swimming pool fees apply – Adult 2,500 yen / Child 1,500 yen per day. The swimming pool is open from 6am – 10pm (last entry – 9:30pm.). Children (4–15 yrs) are welcome to use the pool between 9am – 7pm under adult supervision. 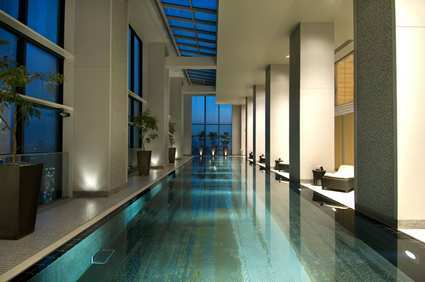 Please note: the swimming pool at the Mizuki Spa & Fitness will be temporarily closed due to annual maintenance from 6am on 9th January to 10pm on 13th January, 2012. 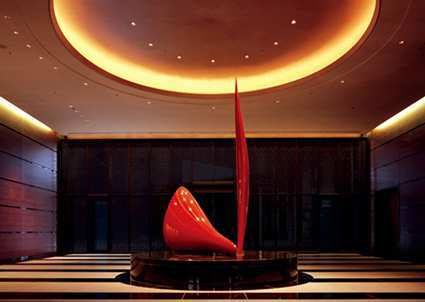 The Conrad Tokyo hotel offers six meeting rooms and two ballrooms accommodating between 10 and 350 guests for a variety of occasions. The Kazanami Ballroom takes its ‘water and wind’ inspiration from Tokyo Bay. As the hotel’s largest ballroom, the 577m² (6,211sq.ft) Kazanami Ballroom is suitable for a variety of Tokyo events such as gala dinners, receptions, weddings and conferences. 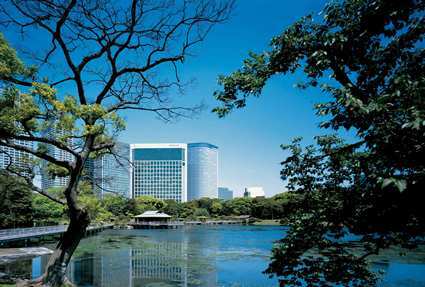 The Hamarikyu Ballroom is designed to reflect the beauty of the Royal Hamarikyu Gardens adjacent to the hotel and is the perfect venue for smaller Tokyo meetings, conferences and buffet lunches and dinners. 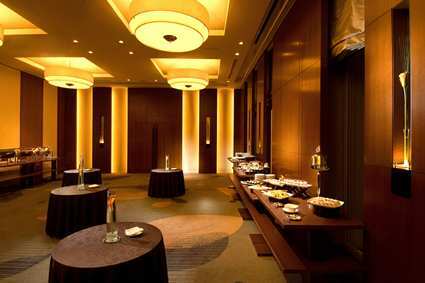 The Hamarikyu Ballroom can accommodate between 60 and 150 people, depending on the function style. 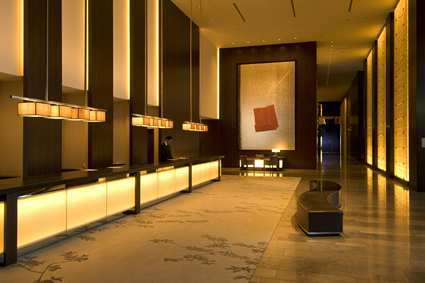 The Conrad Tokyo hotel’s meeting rooms are conveniently located behind the front desk on the 28th floor and can accommodate between 20 and 30 guests. Each meeting room features the latest in audiovisual equipment and benefits from large windows which flood the rooms with warming sunlight. As one of the city’s premier Tokyo business hotels, we offer a choice of great half-day and full-day Tokyo meeting packages that include room rental fees, coffee breaks, projector and screen, stationery and a working lunch. The Conrad Tokyo offers two stunning ballrooms, Kazanami Ballroom and Hamarikyu Ballroom, both of which are ideal for wedding celebrations. Our minimalist and stylish wedding chapel is a romantic vision in white granite and mother-of-pearl, inspired by the purity of water. All in all, the perfect setting for the ultimate Tokyo wedding ceremony or renewal of your vows. The Conrad Tokyo offers tailor-made luxury wedding arrangements. Dedicated wedding coordinators are on hand to assist with flowers, table setups, food, dresses, music, lighting and more to turn your dream wedding into reality. The Conrad Tokyo’s 290 guestrooms and suites combine contemporary luxury and modern technology with the calming and inspirational atmosphere of classic Japanese design. With a generous size of 48m² and three metre high ceilings, the Conrad Tokyo’s accommodations are among Tokyo’s largest, and each offers panoramic views of either the city or Tokyo Bay. Conrad Tokyo’s spacious Bay View Rooms offer 48 square meters of contemporary luxury with panoramic views over the dynamic skyscrapers of Ginza and Shiodome. Each room features sumi-e style cherry blossom painting in the headboard and flooring, perfectly complemented by traditional lantern style lamps. Unwind in the stylish bathroom, separated by a glass partition, which offers a freestanding bathtub, a duo of white marble basins and light-rimmed circular mirror. Conrad Tokyo’s spacious City Rooms offer 48 square meters of contemporary luxury with panoramic views over the dynamic skyscrapers of Ginza and Shiodome. Each room features sumi-e style cherry blossom painting in the headboard and flooring, perfectly complemented by traditional lantern style lamps. Unwind in the stylish bathroom, separated by a glass partition, which offers a freestanding bathtub, a duo of white marble basins and light-rimmed circular mirror. The Conrad Tokyo’s spacious Bay View Rooms offer 48 square meters of contemporary luxury with panoramic views over the Royal Hamarikyu Garden and Tokyo Bay. Each room features sumi-e style cherry blossom painting in the headboard and flooring, perfectly complemented by traditional lantern style lamps. Unwind in the stylish bathroom, separated by a glass partition, which offers a freestanding bathtub, a duo of white marble basins and light-rimmed circular mirror. 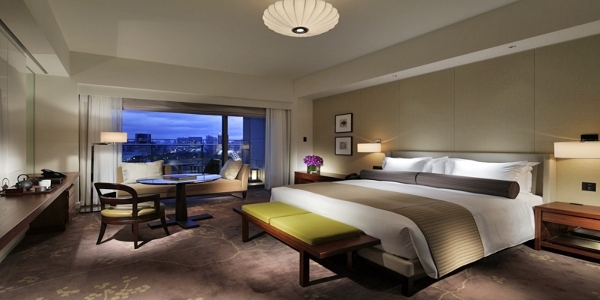 Conrad Tokyo’s spacious Executive rooms offer 48 square meters of contemporary luxury with panoramic views over the Royal Hamarikyu Garden and Tokyo Bay. Work is easy in a stylish Executive Room with Japanese ‘calmness’ and ‘inspiration’ reflected in the design. Executive guests enjoy complimentary access to the Executive Lounge with private check-in and check-out, butler and concierge services, as well as a range of business services all provided by our dedicated team at Conrad Tokyo. Complimentary breakfast, afternoon tea, snacks and evening cocktails are also available in the Executive Lounge. Conrad Tokyo’s spacious Deluxe Suites offer between 110 and 140 square meters of contemporary luxury with panoramic views over the Royal Hamarikyu Garden and Tokyo Bay. These stylish suites feature a separate bedroom and dressing room and reflect Japanese ‘calmness’ and ‘inspiration’ in their design. Relax in the separate living room or enjoy a meal in the dining area. Enjoy complimentary access to the Executive Lounge with private check-in and check-out, butler and concierge services, as well as a range of business services, all provided by the dedicated team at Conrad Tokyo. Complimentary breakfast, afternoon tea, snacks and evening cocktails are also available in the Executive Lounge. Conrad Tokyo’s spacious Executive Bay View Suites offer between 72 and 83 square meters of contemporary luxury with panoramic views over the Royal Hamarikyu Garden and Tokyo Bay. Executive Bay View Suites feature a separate living room, bedroom and walk-in wardrobe, and reflect Japanese ‘calmness’ and ‘inspiration’ in their design. Executive Bay View Suite guests enjoy complimentary access to the Executive Lounge with private check-in and check-out, butler and concierge services, as well as a range of business services all provided by our dedicated team at Conrad Tokyo. Complimentary breakfast, afternoon tea, snacks and evening cocktails are also available in the Executive Lounge. Conrad Tokyo’s spacious Bay View Suites offer between 72 and 83 square meters of contemporary luxury with panoramic views over the Royal Hamarikyu Garden and Tokyo Bay. Executive Bay View Suites feature a separate living room, bedroom and walk-in wardrobe, and reflect modern Japan in their design. 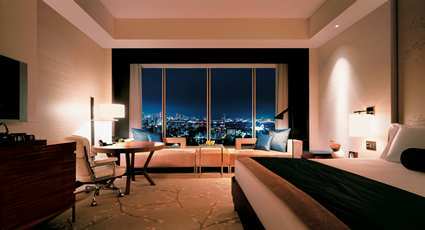 Conrad Tokyo’s 226 square meter Royal Hamarikyu Suite comprises a contemporary and luxurious living room, two bedrooms with king-size and twin beds, two bathrooms and guest washroom, dining area and dressing room. The suite is located on the hotel’s top floor and features panoramic views over the Royal Hamarikyu Garden and Tokyo Bay, and reflects Japanese calmness and inspiration in its design. Royal Suite guests enjoy complimentary access to the Executive Lounge with private check-in and check-out, butler and concierge services, as well as a range of business services all provided by our dedicated team at Conrad Tokyo. Complimentary breakfast, afternoon tea, snacks and evening cocktails are also available in the Executive Lounge. The Conrad Tokyo’s spacious Executive City Suites offer between 72 and 83 square meters of contemporary luxury with panoramic views over the skyscrapers of and Shiodome. Executive City Suites feature a separate living room, bedroom and walk-in wardrobe, and reflect Japanese ‘calmness’ and ‘inspiration’ in their design. Executive City Suite guests enjoy complimentary access to the Executive Lounge with private check-in and check-out, butler and concierge services, as well as a range of business services all provided by our dedicated team at Conrad Tokyo. Complimentary breakfast, afternoon tea, snacks and evening cocktails are also available in the Executive Lounge. The Conrad Tokyo’s spacious Executive Bay View Suites offer between 72 and 83 square meters of contemporary luxury with panoramic views over the Royal Hamarikyu Garden and Tokyo Bay. Executive Bay View Suites feature a separate living room, bedroom and walk-in wardrobe, and reflect Japanese ‘calmness’ and ‘inspiration’ in their design. Executive Bay View Suite guests enjoy complimentary access to the Executive Lounge with private check-in and check-out, butler and concierge services, as well as a range of business services all provided by our dedicated team at the Conrad Tokyo. Complimentary breakfast, afternoon tea, snacks and evening cocktails are also available in the Executive Lounge. 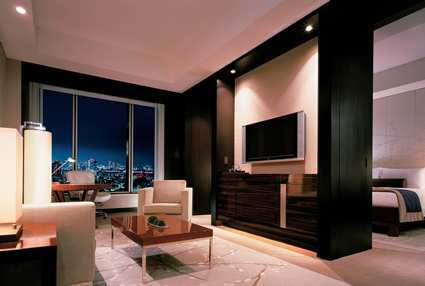 The Conrad Tokyo’s spacious City Suites offer between 72 and 83 square meters of contemporary luxury with panoramic views over the skyscrapers of Ginza and Shiodome. City Suites feature a separate living room, bedroom and walk-in wardrobe, and reflect Japanese modern luxury in their design. The Conrad Tokyo’s spacious Bay View Suites offer between 72 and 83 square meters of contemporary luxury with panoramic views over the Royal Hamarikyu Garden and Tokyo Bay. Bay View Suites feature a separate living room, bedroom and walk-in wardrobe, and reflect Japanese modern luxury in their design. 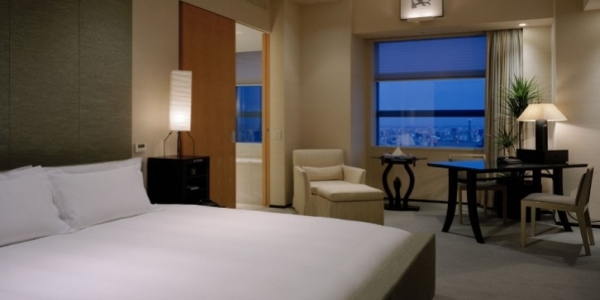 Conrad Tokyo’s spacious Executive Rooms offer 48 square meters of contemporary luxury with panoramic views over the Royal Hamarikyu Garden and Tokyo Bay. 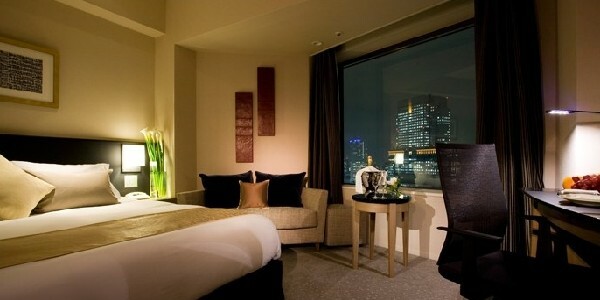 Work is easy in a stylish Executive Room with Japanese ‘calmness’ and ‘inspiration’ reflected in their design. Executive guests enjoy complimentary access to the Executive Lounge with private check-in and check-out, butler and concierge services, as well as a range of business services all provided by our dedicated team at Conrad Tokyo. Complimentary breakfast, afternoon tea, snacks and evening cocktails are also available in the Executive Lounge. Choose from Conrad Tokyo hotel’s 4 restaurants and bar and lounge and enjoy a vibrant, dramatic and theatrical Tokyo dining experience like no other. Take in spectacular views of Tokyo Bay from TwentyEight, our stylish Tokyo bar, or as you indulge in some of the finest cuisine the city has to offer at China Blue. No matter where you choose to dine, you’ll find an inspired menu while enjoying an unforgettable Tokyo restaurant experience. 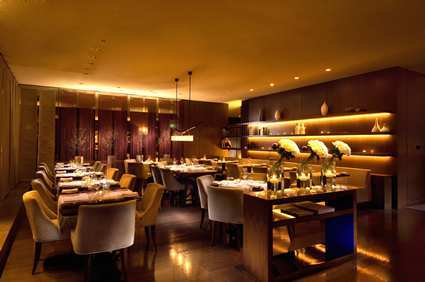 Indulge in a meal at London’s legendary, 3-starred Michelin chef’s signature restaurant at the Conrad Tokyo hotel. 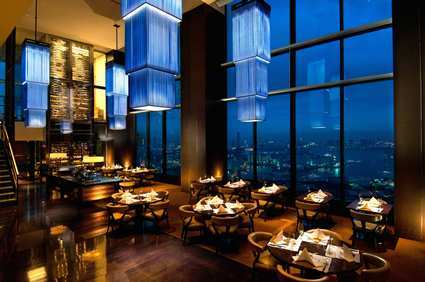 This exquisite Tokyo restaurant is located on the 28th floor of the hotel and features 7 metre floor-to-ceiling windows offering breathtaking views equalled only by the exquisite French cuisine. The Chef’s Table is the ultimate exclusive dining experience, a privileged space before the open kitchen where up to 8 guests can enjoy friendly banter from their front-row seat as our chefs prepare a culinary masterpiece. Gordon Ramsay at Conrad Tokyo was been awarded a star by the Michelin Guide Tokyo for the second consecutive year. Open for dinner. Take some time out and indulge in our very special ‘just for girls’ offer available every Wednesday evening. Cerise by Gordon Ramsay at the Conrad Tokyo hotel offers informal, brasserie-inspired selections for breakfast, lunch and dinner. Attractive ornaments, mirrored screens and glass partitions combine to create a relaxing ambience at this Tokyo restaurant. This modern interpretation of a traditional Japanese “Kura” offers the best of Kaiseki, Sushi, Teppan, plus a lounge and private rooms. Décor reflects the meaning of Kazahana: “Flowers blown in the wind”. Soaring ceilings, black and white pillars and vividly coloured chairs and countertops lend a striking and original ambience. Open for lunch and dinner. This Michelin-starred avant-garde restaurant brings a new and modern style to Chinese cuisine with a wide selection of tantalising dishes. It further features a spectacular 8 metre walk-in wine cellar. 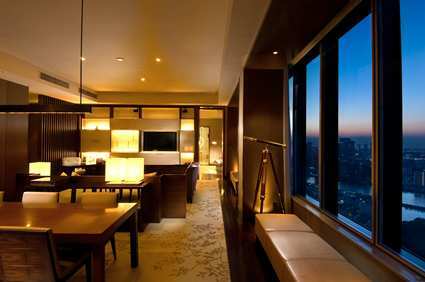 Three private dining rooms are available with panoramic views over the Hamarikyu Garden and Tokyo Bay. Chef Albert Tse, who grew his reputation in Singapore at the renowned Jiang-Na Chun restaurant, is the creator behind the original Modern Chinese dishes. The restaurant has a capacity for 110 guests and is open for lunch and dinner. 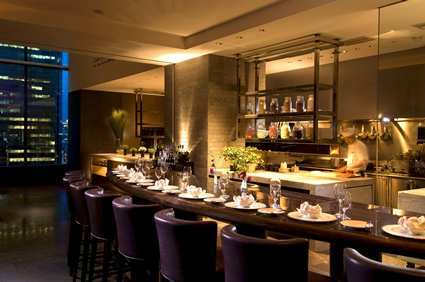 China Blue has been awarded a star by the Michelin Guide Tokyo 2010 for the third year running. With breathtaking views of Tokyo Bay, Twenty Eight Bar & Lounge at the Conrad Tokyo hotel is the perfect place to meet for afternoon tea or hold an elegant function. This Stylish Tokyo bar comes alive in the evenings with live music performances and a sophisticated ambience.